A family run building firm with 40 years experience in the building trade, we pride ourselves on delivering our services to a high standard. Please call to arrange a free no obligation quotation today! Keith, Ben and their team installed a new felt/wood roof and guttering to replace an irregular shaped corrugated roof covering an open area and potting shed adjacent to the side of our Victorian house. They came up with an elegant but simple design to deal with the different levels of the previous roof and water run off problems. The result exceeded our expectations. They always listen to our concerns, offer good advice and are very friendly to work with. In addition to the above, they also replaced some pointing around doors, windows and walls. This is the 4th time we have used them since 2015 and we have always been very pleased with their work. Keith and his team did a great job replacing a marble piece on our front steps and repairing the cement foundation under our front fence in South Kensington. They were fast, efficient and friendly, and scheduled the work to be completed right before the holidays, which we very much appreciated. We highly recommend them. Used Keith, Ben and a colleague to repair water damage in my bathroom and kitchen caused by leaking pipe in upstairs flat. Hard to fault them: high standard of workmanship, prompt and speedy service, reasonable price, tidy and great attention to detail. Very courteous and helpful. Clean up thoroughly when finished. Job involved partially replacing ceiling, replacing cracked tiles, making good walls and repainting. They also sorted out a damp chimney breast. I would have no hesitation in recommending them. No problem recommending Keith and Ben. Easy to deal with. Good suggestions/recommendations. Brick and stone work looks very good. Trustworthy, efficient and a pleasure to do business with. This is the second time Keith and Ben have done pointing on different walls on our property which is in a Georgian terrace. We are benefiting from work on the house wall which was done earlier this year - there is no further risk of damp and there is visible enhancement. They listen, their diagnosis, advice and work is trustworthy. They do not suggest unnecessary additions. They offer a prompt service, keep appointments, bring all their materials and get on with the job efficiently and clear up as they go. Their costs are reasonable I have no hesitation in highly recommending them. They are well established, with a portfolio which they invite you to see before you engage with them. It is a pleasure to do business with them. J. Woods. Keith and Ben recently repaired my front garden including rebuilding two brick piers that had become unsteady. They came to assess what needed to be done immediately I contacted them and provided a quote and timescale for the work to which they adhered throughout. They were at all times professional, reliable, pleasant and helpful. Keith and Ben did a fantastic job replacing our front door and doing all the brickwork around the door. We had a UPVC door in a 1930s house and wanted to replace it with a wooden door with side lights. We sourced a door and stained glass, and Keith fitted it and found bricks which matched our house and installed the new doorway and brickwork for the different shape of the door and windows, restoring it to an appearance which matched the original style of the house. All the work they did was very high quality and the end result looks 100% better than before. I had wanted to post some photos to demonstrate this but I don't think I can on this site. However I can thoroughly recommend Keith's work, we were really pleased with the quality and attention to detail. I've used Keith and Ben a couple of times over the years to sort out the brickwork on our Victorian terrace. This time the job was internal and was completed entirely to my satisfaction. They also sorted out some other work that was required and co-ordinated with other tradesmen. Keith answered my initial request promptly and came round the same day to give me a quote. Honest, efficient and high quality. The second time Keith and Ben have worked on our property in East Dulwich. Again they did not disappoint; knowledgeable, friendly, trustworthy and nice to have around. Great to be able to work with a small family business where you know you're not going to be disappointed. Fabulous work, tidy and easy to work with! 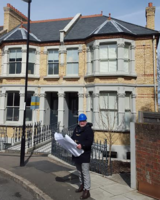 Keith, Ben and team have done a number of projects for us on our 5 bed Victorian house in Clapham. They built a gorgeous 6 ft brick wall around our extensive garden, paved in front of our Summer house, repointed the entire house, repair parts of our conservatory, renovated wood floor and decorated throughout. They did a very high quality job and were a pleasure to have around. They cleaned up each day conscientiously and were very good about turning up on time and regularly. Communication was very easy, pricing was transparent and they are scrupulously honest. I would highly recommend.